The South Chiller Plant Conversion project (left) will convert a large part of south campus from steam to simultaneous heating and cooling. The renovation of Hamilton Hall (right) last year received a LEED Gold certification. With a new director of sustainability, reduction in carbon emissions and energy use, and LEED-certified building renovations, Miami is on track to meet its Sustainability Commitments and Goals (SCAG). The 2016-2017 and 2017-2018 sustainability committee was co-chaired by Suzanne Zazycki, associate director of the Institute for the Environment and Sustainability (IES), and Tim Cameron, professor and former chair of mechanical and manufacturing engineering. This year it is co-chaired by Zazycki and Helaine Alessio, professor and chair of kinesiology and health. Miami's sustainability committee, drafters of the SCAG, reported on the progress of sustainability at Miami for FY 2016-2018. Here we present the top six sustainability highlights. 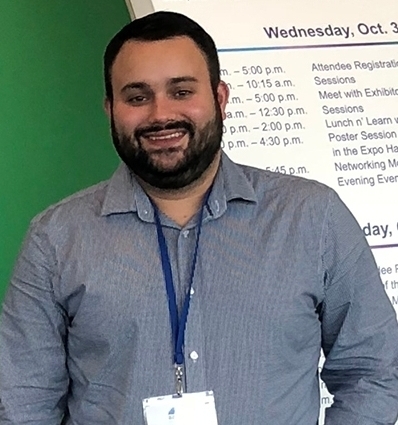 David "Adam" Sizemore joined Miami in July after receiving his doctorate in applied sociology from the University of Louisville in May. His research focus is on environmental, Appalachian and food sociology. Sizemore replaces Yvette Kline, former director of sustainability and energy conservation, who retired July 2016. “I am beyond thrilled to be a part of the Miami community," Sizemore said. He plans to discover and foster new avenues to reduce Miami’s environmental impact. "It is crucial we guarantee our actions today do not impede the efforts of future generations to come," Sizemore said. "This will require a communal effort across students, faculty and staff, and I look forward to engaging with each and every one of you to help make Miami a more sustainable campus. Kelsey Forren, (Miami BA, MA ’18) master’s student in IES, will assist Sizemore as the new sustainability coordinator. 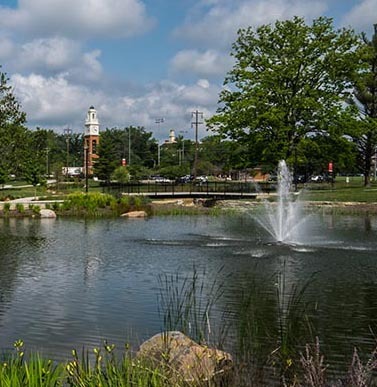 With input from the university community, Miami's original Sustainability Commitments and Goals, endorsed by then-President David Hodge in 2010, were updated by Kline and the sustainability committee in 2016. Through concerted efforts in energy and infrastructure planning, changes to operations and practices, and the development and enhancement of academic programs, most of the 2010 goals have been met or are on track to be met within the next 10 years, according to then-sustainability director Kline. Other goals and commitments are now outdated or obsolete due to emerging technologies or changes in policies at the state and national levels. Read the six 2016 SCAG goals on the Sustainability website at https://miamioh.edu/about-miami/sustainability/goals/. The 2016 SCAG Goal 1 aims for a reduction of emissions of carbon dioxide and other greenhouse gases relative to Oxford campus FY 2008 by 30 percent in 2020; 40 percent by 2025; and 50 percent by 2030. Goal 1 has been met and exceeded for 2020 (refer to figure at right; per gross square foot). Energy use and emissions were reduced on the Oxford campus in part due to geothermal heating and cooling (GHC). Eventually about 40 percent of buildings on campus (mainly Western and North quad) will be converted to GHC. The South Chiller Plant Conversion Project is converting a large portion of the south half of campus from steam to simultaneous heating and cooling. No coal was burned in 2017. For FY18, utilities expenses were $567,935 less than budgeted. From October 2016 through July 2018, 12 building renovation projects on the Oxford campus received LEED (Leadership in Energy and Environmental Design) certification, according to Robert Bell, associate director of campus planning. Two building renovations — Hamilton and Dennison Halls —achieved Gold level. Refer to the chart at right for buildings certified LEED from 2017-2018. 59 percent more energy efficient, and 44 percent less water use, than a non-LEED residence hall of comparable size. Open space around the building is greater than the footprint of the building itself. The renovation preserved nearly every square inch of the building's original core and shell and used Forest Stewardship Council wood products for the majority of the project. Ninety-five percent of the construction waste was salvaged or recycled. 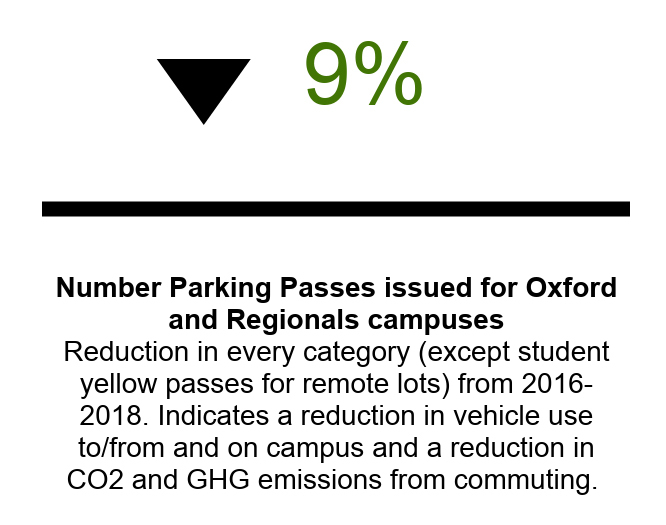 The reduction in the number of parking passes issued 2016-2018 (see figure at right) implies a reduction in vehicle use to/from and on campus — and a reduction in carbon dioxide and GHG (greenhouse gas) emissions from commuting — according to Ben Spilman, director of parking and transportation services. Eight acres of land that had been farmed using traditional techniques are now farmed using organic techniques by Miami’s Institute for Food farm, with plans to request additional acreage. An IES Professional Service Project this year will explore planting about 10 acres of the DeWitt Fields with native grasses and trees to be used for educational purposes. Miami reached Silver status in the 2013 and 2016 STARS reports submitted to the Association for the Advancement of Sustainability in Higher Education’s Sustainability, Tracking Assessment & Reporting System (STARS). “AASHE’s STARS rating system is a great way for Miami to monitor our sustainability efforts and progress," Sizemore said. "It is also a great way for us to explore new avenues of improvement." He will work with the sustainability coordinator and members of the sustainability committee to report and update our sustainability rating in Spring 2019. Read the first report on sustainability at Miami in the Oct. 9, 2012, Miami news story: "First annual report: Commitment to sustainability is broadening and deepening."